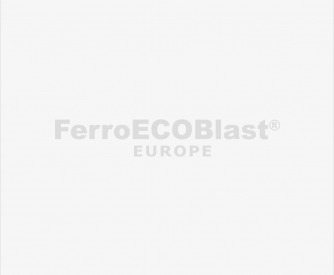 FerroECOBlast Europe Vacuum blasting machines are the most ecological and powerful blasters on the market today. Vacuupress 60 SG-PNEUM is provided for the heaviest blastings with coarse or fine steel grit and also with all other abrasives as well (corundum, ceramic abrasives, glass beads, etc…), with the built-in specific regulation for correct sucking power. The machine is easily movable and completely powered by pressure air, without any electrical socket. Blasting process is easy and quick with light aluminum blasting head with a brush, where abrasive and dust are immediately sucked away from the surface without any pollutions to the surrounding. This type of machine is equipped with a 10m blast/sucking tube, which can be easily extended. Minimalistic design with a strong frame and large wheels allow easy movement of the whole machine, and additional movable supporting profile on the top carrying blasting head and help operator for easier work. Pneumatic driven Vacuum head with Start/Stop safety trigger, connected to the very effective filter unit, sucking and recover any kind of abrasive, including most heavier Steel Grits, without any limitation. For blasting on flat surfaces can be used a standard protective brush, and for corners or outer edges, we deliver set of specially designed brushes with the machine. Vacuupress 60 SG-PNEUM-PEEN is a special upgraded machine, which allows mobile SHOT PEENING Process under special conditions. The machine is as standard equipped with special dosing system, precise pressure regulator and can use only prescribed and conditioned Peening Shot. Ask for details and additional Almen testing equipment set. Even with this machine, there is no direct risk for the operator. We deliver safety glasses or shield, light protection gloves, and hearing protection with the machine. Strong, but light protection overall with protective shoes on request. For powerful and successful dustless blasting is the important right choice of abrasive and enough capacity of Pressure air, which is slightly higher because of simultaneously blasting and sucking. Please contact our experts for details and the right choice of abrasive and components.